For longitudinal and face turning, Sandvik Coromant now offers CoroTurn 300 metal cutting tools that are designed for high-volume, OD steel-turning operations. The Sandvik CoroTurn 300 metal cutter features stable insert clamping. Its eight-edged inserts, with 80 degree cutting edges, provide high-chip control, and improved surface finish. The inserts ensure good heat transformation for predictable performance and wear. More edges also mean fewer inserts required, which in turn means better inventory control, and less carbide per edge means less waste and material to recycle. Stable insert clamping for the CoroTurn 300 is accomplished through the company’s patented iLock interface. All machining generates forces on the metal cutting tools and these forces can cause micro-movements of the insert in its seat. Even the smallest movements can negatively affect tool performance and result. 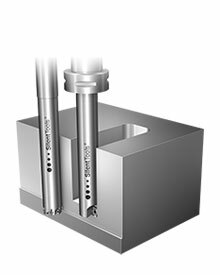 Forces on the cutting tool create micro movement that can affect cutting tool performance. To counter this, the iLock system securely locks the insert in place and provides tool accuracy to within ±0.05 mm (0.002 in. ), giving the operator indexing repeatability for a better surface finish and increased tool life. Tools with iLock design have rails or serrations on the tool holder and corresponding slots on the insert for tight locking. This prevents the cutting forces from affecting the tool position. Another way the CoroTurn 300 offers enhanced chip breaking capabilities is through high-precision (HP) over and under coolant. 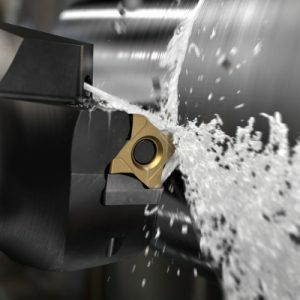 Coolant from above controls the chip breaking for secure machining while under coolant controls the temperature for long and predictable tool life. Other features of the tool are the Coromant Capto interface in a variety of sizes and the Quick Start (QS) shanks, which enable quick tool changes and easy coolant connections for maximized production time. Sandvik Coromant recommends only under-coolant when the feed rate exceeds 0.2 mm/revolution and the depth of cut (DOC) is larger than the nose radius of the insert. Under these conditions, over-coolant might cause minor edge wear and increase crater wear in steel, and make it difficult to evaluate this wear. Conversely, if the DOC is either smaller than the nose radius or the feed rate is slower than 0.2 mm/revolution, using both over- and under-coolant is recommended, according to the Website. For example, in one automotive application (an outer CV joint) a Sandvik Coromant CoroTurn 300 insert with -L4 geometry was used to turn low-alloy steel (P2.1.Z.AN) with 3 bar (43.5 psi; 300kPa) of coolant pressure at a feed rate of 0.35 mm/revolution and a 2.5-mm DOC. The CoroTurn (CT) insert delivered a 158% improvement in tool life versus an insert with -PF geometry, while the same CT300 insert delivered a 200% tool life improvement using only under-coolant. The eight-edged inserts for the CoroTurn 300 are available in grades GC4325 and GC4315 featuring Inveio coating, a unidirectional crystal orientation for high wear resistance and long tool life. 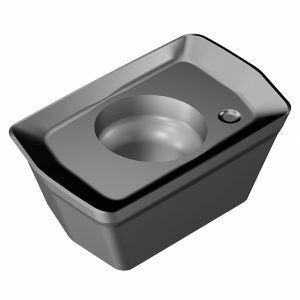 The unique insert design has excellent chip breaking capabilities and less carbide per edge, which reduces the impact on our environment with less material to waste or recycle. Plus, more edges allow for better inventory control. The coating is applied through a chemical vapor deposit process (CVD) that through a chemical process turns a solid firm into a gaseous deposit onto the substrate. Typically, when using this process, the coatings’ crystal growth direction is random. When developing Inveio™, Sandvik found a way to control the growth in this coating layer. Researchers were able to ensure that all of the crystals lined up in the same direction, with the strongest part towards the top surface. The tightly-packed uni-directional crystals create a strong barrier towards the cutting zone and chip and greatly improves crater wear and flank-wear resistance. Heat is more rapidly lead away from the cutting zone, helping the cutting edge stay in shape for longer times in cut. For more information on the CoroTurn 300, contact your Steiner Metalworking application engineer at (800) 323-TOOL. 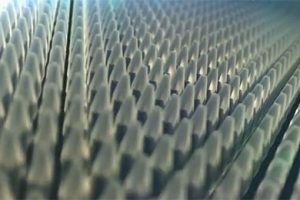 When Sandvik Coromant released a video in support of its new PrimeTurning™ turning technology, the video almost appeared to be going in reverse. The cutting tool traversing from chuck to the end of the workpiece. Had it been going in reverse, however, material would have magically gone back on the blank, as opposed to the long strips of material being removed first along one axis and then another. PrimeTurning is a new turning method that enables turning in all directions. Unlike conventional turning operations, PrimeTurning allows machine shops, OEMs and other users to complete longitudinal facing and profiling operations with a single tool. 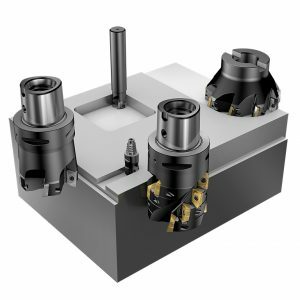 In addition to the prime turning technology, the company released two types of tooling, an A-type for fine finishing and a B-type for roughing applications. 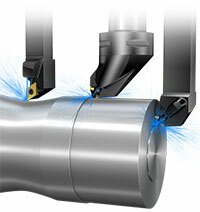 With this forward-and-back cutting capability, and its innovative tooling technology, Sandvik Coromant believes that some applications could achieve productivity increases of more than 50% as compared to conventional techniques. 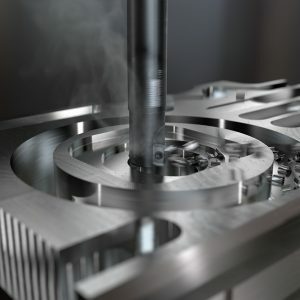 For instance, Cutting Tool Engineering magazine reported on an Italian manufacturer who reduced the cycle time for machining a shaft from 2.42 to 1.36 minutes and extended the tool life per edge from four pieces to nine by using the PrimeTurning system. According to the report, a competitor’s conventional insert ran at a cutting speed of 150 m/min., a feed rate of 0.012 ipr, and a DOC of 0.079 in. By contrast, the CoroTurn® Prime B-type roughing insert ran at double the cutting speed and DOC, and a feed of 0.032 ipr when turning forged, ASTM B564 nickel alloy with a hardness of 250 HB. 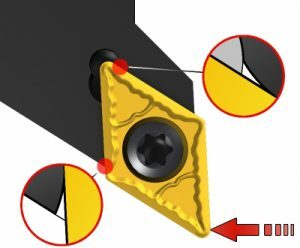 Major reasons for the reported success of the PrimeTurning technology is due to the small entering angle relative to the feed direction, as well as a higher lead angle that allows the user to cut substantially faster. The turning operation creates thinner, wider chips that spread the load and heat away from the nose radius. In addition, as cutting is performed in the direction moving away from the shoulder, there is no danger of chip jamming, which can occur if chips are pushed against the shoulder during turning. PrimeTurning is supported by the introduction of two dedicated CoroTurn Prime turning tools, part of the CoroTurn insert tooling line, and the PrimeTurning code generator, which supplies optimized programming codes and techniques. The PrimeTurning methodology and CoroTurn Prime A-type tool (left) and B-type (right) enable turning in all directions. The CoroTurn Prime A-type tool with three 35° corners designed for light roughing, finishing and profiling. The CoroTurn Prime B-type tool with strong corners designed for rough machining. The ​CoroTurn Prime inserts feature three edges per corner. One edge each for longitudinal, facing and profiling thus distributing the wear over a longer edge and not just the insert tip. It also moves heat away from the cutting zone that helps inserts last substantially longer. Sanvik Coromant also developed a Code Generator to develop specialized toolpath strategies and take full advantage of CoroTurn Prime insert design. The generator supplies programming codes and techniques to set up maximum parameters and variables for a particular application to secure maximum output in ISO P steels, ISO M stainless steels and ISO S heat-resistant super alloy (HRSA) materials.